The Velbon Sherpa 200R tripod is a sturdy Aluminium tripod with 3 section clip lock legs and their acclaimed 3-way panhead PH157Q with Quick-release platform. The head incorporates some clever features such as a one-touch handle that allows locking of both pan and tilt movements with one twist and with a left mounted handle this allows the user to keep their right hand free to operate the camera. The easy slide centre column can also be inverted for low level macro or copy work. 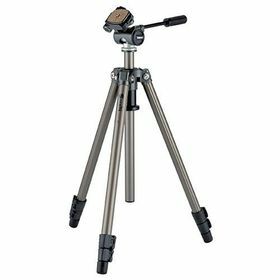 Overall this is a high quality, aluminium, full size tripod which is a bestseller within the Velbon Sherpa range, and comes with a 5 year warranty. It is suitable for both enthusiast Photographers with full size DSLR and mirrorless cameras and can be used with cameras & lenses up to a combined weight of 3.5Kg.